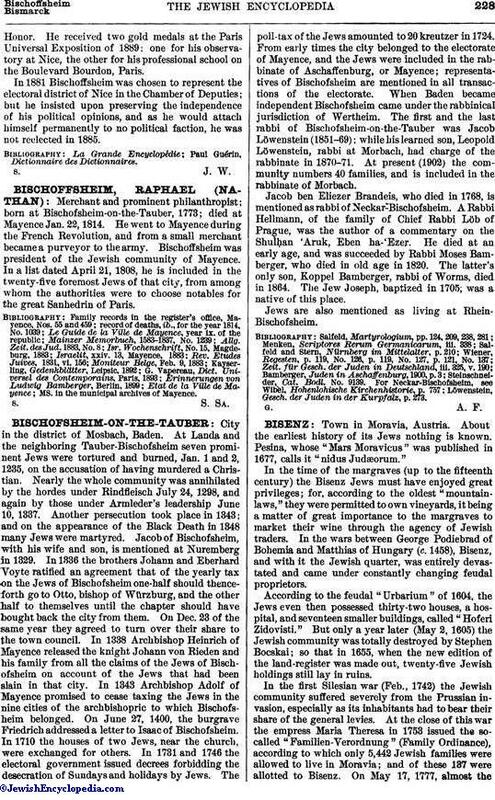 French banker; member of the Institute of France; son of Louis Raphael Bischoffsheim; born July 22, 1823, in Amsterdam. He received his early education in his native city, and was then sent by his father to Paris to take a special course preparatory to entering the Ecole Centrale des Arts et Manufactures, where he was admitted in 1842. On graduating from that school he was appointed inspector of one of the southern railway lines belonging to the system controlled by his father, and remained in that position until 1873, when he succeeded his father in the banking firm. Genealogy of the Bischoffshelm Family. 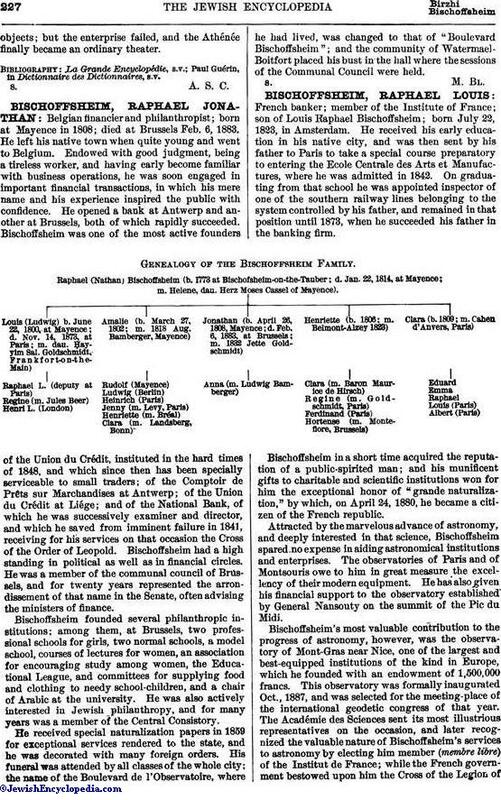 Bischoffsheim in a short time acquired the reputation of a public-spirited man; and his munificent gifts to charitable and scientific institutions won for him the exceptional honor of "grande naturalization," by which, on April 24, 1880, he became a citizen of the French republic. Attracted by the marvelous advance of astronomy, and deeply interested in that science, Bischoffsheim spared no expense in aiding astronomical institutions and enterprises. The observatories of Paris and of Montsouris owe to him in great measure the excellency of their modern equipment. He has also given his financial support to the observatory established by General Nansouty on the summit of the Pic du Midi. Bischoffsheim's most valuable contribution to the progress of astronomy, however, was the observatory of Mont-Gras near Nice, one of the largest and best-equipped institutions of the kind in Europe, which he founded with an endowment of 1,500,000 francs. This observatory was formally inaugurated Oct., 1887, and was selected for the meeting-place of the international geodetic congress of that year. The Académie des Sciences sent its most illustrious representatives on the occasion, and later recognized the valuable nature of Bischoffsheim's services to astronomy by electing him member (membre libre) of the Institut de France; while the French government bestowed upon him the Cross of the Legion ofHonor. He received two gold medals at the Paris Universal Exposition of 1889: one for his observatory at Nice, the other for his professional school on the Boulevard Bourdon, Paris. In 1881 Bischoffsheim was chosen to represent the electoral district of Nice in the Chamber of Deputies; but he insisted upon preserving the independence of his political opinions, and as he would attach himself permanently to no political faction, he was not reelected in 1885. Paul Guérin, Dictionnaire des Dictionnaires.